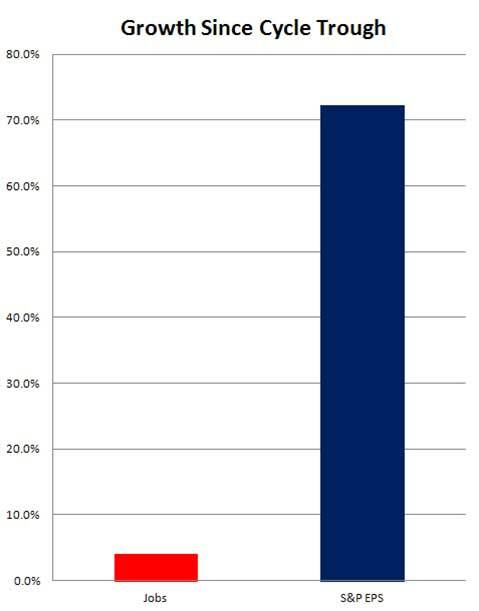 Zerohedge picked up Bernanke's statement and generated this fast reality graph of the S&P versus jobs, copied below. As the graph grotesquely shows, corporations are doing great while the American people suffer. Federal Reserve Chair Ben Bernanke testified before the House of Representatives Committee on Financial Services today and the world was all ears. Bernanke was presenting the semi-annual monetary policy report and Wall Street wants to know if they continue to bet on free money, otherwise known as quantiative easing. First, Bernanke acknowledged the terrible employment conditions. The jobs situation is far from satisfactory, as the unemployment rate remains well above its longer-run normal level, and rates of underemployment and long-term unemployment are still much too high. Then, the Fed is justifying continuing their quantitative easing based on the terrible employment conditions, which all things considered sure doesn't seem to be doing much for American labor. We intend to continue our purchases until a substantial improvement in the labor market outlook has been realized. The quantitative easing end game hasn't changed either. The below is just a reiteration of previous announcements. We expected to continue to reduce the pace of purchases in measured steps through the first half of next year, ending them around midyear. At that point, if the economy had evolved along the lines we anticipated, the recovery would have gained further momentum, unemployment would be in the vicinity of 7 percent, and inflation would be moving toward our 2 percent objective. They also have an end game on the federal funds rate with an unemployment rate of 6.5%. 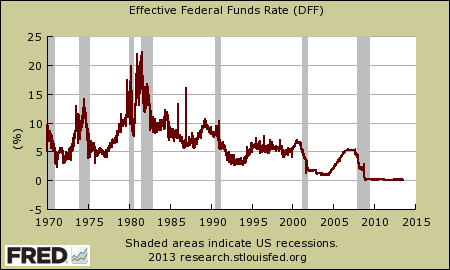 The Federal Funds Rate has been effectively zero. The Committee anticipates that its current exceptionally low target range for the federal funds rate will be appropriate at least as long as the unemployment rate remains above 6-1/2 percent. That said, traders go nuts on the demise of quantitative easing and immediately jumped on the possibility of a delay in ending it. Bernanke mentioned responding to data and the potential to delay the tapering off of asset purchases and traders got their hopes up. I emphasize that, because our asset purchases depend on economic and financial developments, they are by no means on a preset course. On the one hand, if economic conditions were to improve faster than expected, and inflation appeared to be rising decisively back toward our objective, the pace of asset purchases could be reduced somewhat more quickly. On the other hand, if the outlook for employment were to become relatively less favorable, if inflation did not appear to be moving back toward 2 percent, or if financial conditions--which have tightened recently--were judged to be insufficiently accommodative to allow us to attain our mandated objectives, the current pace of purchases could be maintained for longer. The Fed releases future economic projections periodically and has any one else noticed that long term economic projections are always seen with rose colored glasses? We see this over and over again, way down the road they project the economy and employment will move towards the real potential output. Yet what is great reason would this happen? We see no policy or technological shift that would boost the real economy in 2015. More validating, as time gets nearer, without fail, those FOMC economic projections are revised lower and lower. Most participants saw real GDP growth beginning to step up during the second half of this year, eventually reaching a pace between 2.9 and 3.6 percent in 2015. They projected the unemployment rate to decline to between 5.8 and 6.2 percent by the final quarter of 2015. They base their reasoning on less austerity and increased taxes being adjusted for. Still demand rules on economic growth and where this boost is going to come from is not visible. Some of the testimony Q&A was rather fun. Bernanke said Congress is too focused on short run fiscal policy and thus repressed economic growth. No kidding Congress is an economic kill joy as most of their agenda has little to do with getting Americans back to work and the economy humming. On financial reforms it seems the comments are almost an after thought. Here's some token Bernanke verbiage on financial regulation. The Federal Reserve, with the other federal banking agencies, adopted a final rule earlier this month to implement the Basel III capital reforms.2 The final rule increases the quantity and quality of required regulatory capital by establishing a new minimum common equity tier 1 capital ratio and implementing a capital conservation buffer. The rule also contains a supplementary leverage ratio and a countercyclical capital buffer that apply only to large and internationally active banking organizations, consistent with their systemic importance. In addition, the Federal Reserve will propose capital surcharges on firms that pose the greatest systemic risk and will issue a proposal to implement the Basel III quantitative liquidity requirements as they are phased in over the next few years. The Fed also released their Beige book, which has no real surprises in it, on the state of economic growth and conditions per district. The Beige book is available here. "Then, the Fed is justifying continuing their quantitative easing based on the terrible employment conditions, which all things considered sure doesn't seem to be doing much for American labor." Of course not. The fed basically told the banks and multinationals we'll keep giving you free money and buying your worthless paper at par until the job situation improves. Why on earth would they expand hiring when they can get free money from the fed without lifting a finger?